Happy New Year. We hope everyone made it through Saturday's snowstorm and is keeping warm and safe today. 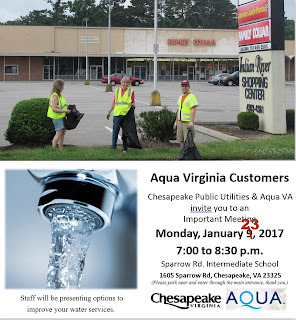 The important public meeting about Aqua Virginia and the Indian River Shopping Center being held by the City at Sparrow Road Intermediate will be re-scheduled for Monday, January 23rd. We are asking you to attend; a good turnout from the broader community will make sure efforts to fix the issues keep moving forward. On Saturday, 1/14, we'll be removing invasive Ivy at Indian River Park, and on Thursday, 1/19, we hold our Annual Meeting to finalize plans for the rest of the year. Participation by so many community members is what made successes possible in 2016 and we need your help in 2017 to do even better. Hope to see you at our upcoming events! Meet at the park entrance at Rokeby Ave. and Main St. (2001 Rokeby Ave.) which is located just south of Military Highway, i.e. across Military Highway from the Fire Station. We'll be focusing on removal of invasive species, primarily English Ivy. Please wear closed-toe shoes, a hat and bring work gloves. We will have water and lots of snacks. (We also always encourage folks to bring their own water in reusable bottles to minimize use of plastic bottles). Participants under 18 years of age must have adult supervision. Join us as we discuss plans and priorities for 2017, which will mark our group's 5th anniversary, and hold elections for our officers and board and discuss plans for coming year. There will be light refreshments and door prizes. Meet with Parks, Recreation, and Tourism staff to discuss ideas for the newly renovated activity center in the Park at the corner of Providence and Rokeby. The facility will focus primarily on serving the needs of Chesapeakes 55+ population. Learn about feedback they have received, hear the staff's ideas, and share your thoughts.